I am about to jump from the "Power Pole." 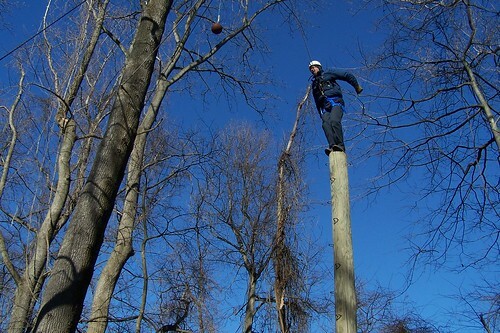 I spent last week at a training for challenge course facilitators. Yes, it’s job related. 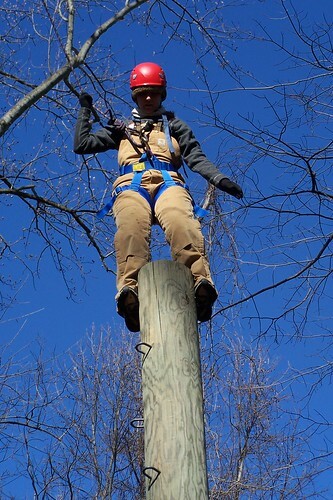 The photo above is of me, being a guinea pig for the other members of the class, who are practicing using a “just right descender,” which is a section of utility pole set in the ground, with a series of holes drilled through it, which the belay rope runs through for friction. The most difficult part of this element is when you run out of hand holds while climbing up and have to take that last step up to the top of the pole. Megan is poised to take that step in this picture. Megan has run out of handholds. Now what? In this next shot you can see how Tom is attached to the belay rope with a double figure eight knot and two carabiners. The minimum standard for carabiners on a challenge course is 22.2 kilonewtons, which is roughly equivalent to 5,000 pounds of force. These are much stronger. The rope is also much stronger and is a “dynamic” belay rope, made to stretch when loaded, in order to absorb shock. It is attached with a pulley, also far exceeding the minimum, to an aircraft grade steel cable running horizontally above the area in the photo. Tom stretches out to tap the tether ball. This is a closer look at a carabiner. The loop on my climbing harness, and the harness itself also exceed the 5,000 pound minimum. Some courses now use two carabiners, with the gates facing opposite directions, to prevent accidental opening because of friction turning the gate. You can see the gate facing out away from me in this picture. It is threaded so that the wheel, that knurled piece screws down and holds it closed. I am not wearing a chest harness on this element, the “Pirate’s Crossing,” as I don’t intend to leap off into the air. There is less chance that I would turn upside down and I would not get build up much velocity before the rope took up, even if I did. Here you see the belay team, working on the “Multivine,” another climbing element. Dan is demonstrating the Alpine BUS method of belaying. 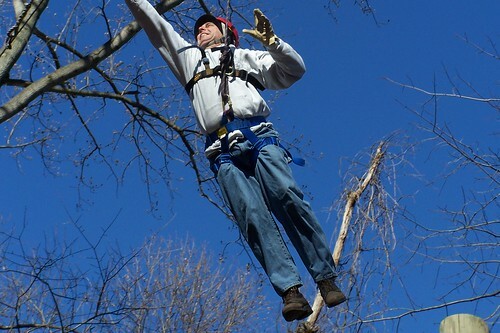 He is attached to the rope with an aluminum belay device, which give him a great deal of control over the rope through “shear,” and a steel carabiner. Dan’s hands will both remain on the working end of the rope at all times. He can brake the rope by moving his hands down, bending the rope over the lip of the belay device, which he did a split second after this photo was taken. 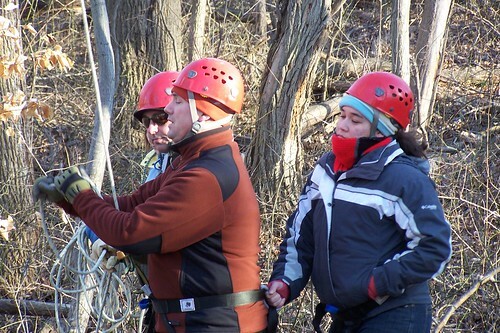 Megan is anchoring him by holding the loop on the back of his harness and Tom is acting as backup belayer and as rope handler- multitasking – he can brake the rope if Dan suddenly keels over. Did I mention that it was cold outside? This is what the Multivine looks like. Patrick is demonstrating for us how to get to the first of a series of ropes hanging from a cable above his head. 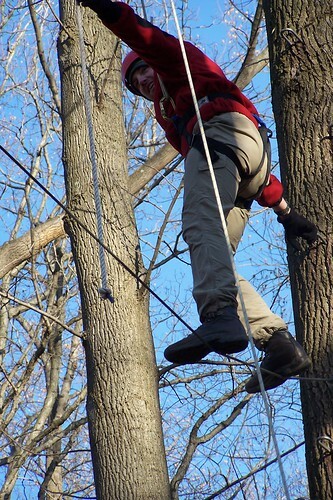 Patrick must let go of the tree in order to grasp the first rope on the "Multivine." 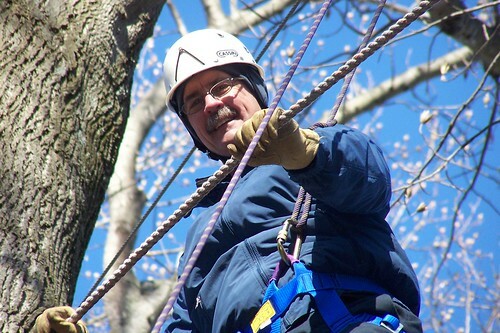 There is a lot more to a challenge course than climbing up to high places. Of course that’s what I took pictures of. Climbing is what gets people involved, or what keeps them away, depending. We worked on low elements and field games. We learned “processing,” in which participants find meaning in these activities. The concepts of “full value commitment and “challenge by choice”™ were stressed again and again. Each participant chooses his or her own level of participation, yet each is encouraged to give a commitment to participate to the fullest extent they can. Full value commitment isn’t about climbing higher or jumping off things like some kind of nut. It’s about being a part of the team, speaking up when an activity is discussed, entering into the spirit of a game, being honest with yourself and your teammates. DISCLAIMER: I’ve been doing this for eight years and it was worth my time and money to spend the last week training in it again. If you are thinking about doing something like this on your own, think some more. Go find a certified professional to take you through this stuff or stay on the ground. Note: “Challenge by choice” is a registered trademark of Project Adventure. There’s no need to fear, Underdog is here. Sorry I just had to do this you look so superhero type up in the sky like that. I promise that you wont find me doing that unless I have a desire for hurting myself. Seems like a strange training for someone who cleans swimming pools. You got lots of hats…. The pool is my job. The climbing tower is my job. I also do lawn mowing, roofing and fix clogged toilets. Today I shoveled snow all day. Just be careful because I use to work like that and had six heart attacks that stopped me cold turkey. I have a lot of respect for someone who works hard and that was how I was raised and taught my kids. There are times that I wonder what happened. Just my body finally told me to quit and pace myself. I can do the fix clogged toilets and I shovel snow but I go real slow now. I do not climb no more too much blockage to the legs now. No grass to mow any more. (yea) Not hardly any swimming pools up here in Moscow. I wish that I could still do all that but I pace myself and do what I can. Like I said you have lots of hats. I miss all my hats and I am learning to get new hats that require less of my heart. Just do me a favor listen to your body! My Grandpa worked like you do until he was 91 years old. (he was amazing) My Dad and his 3 brothers all died at 50 years old. I already passed my Dad and Uncles. I want to see that 90 year old. OK, so you’re hosting my 90th birthday party. I want a band. I’m going to learn salsa dancing. Find a good hot salsa band, OK? There’s not much I’m afraid of other than heights. Well, not the height, it’s the falling and sudden stop I fear. Not making that sudden stop is the trick, John. That’s why we train, train and train to be facilitators. You’re safe with me. do you have any pictures of your just right descender? I don’t. But Dan Ashe probably does. Email me and I’ll connect you.